So soon it will be official. But what will the name be? Just Strikers. Fort Lauderdale Strikers? South Florida Strikers? Miami FC/Strikers? Can someone tell me what's going on? If you ask me, I vote for Fort Lauderdale Strikers. I just looks right, know what I'm saying? 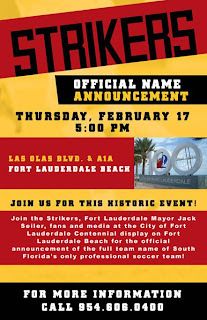 I'm just going to write Fort Lauderdale Strikers a few more times because it makes feel so good seeing it. 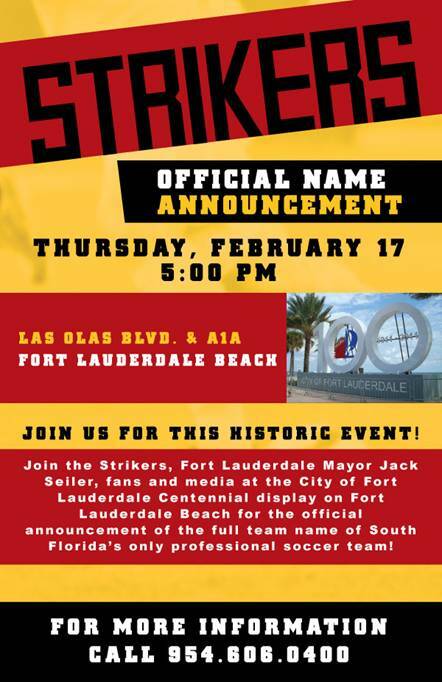 I wonder if a new Fort Lauderdale Strikers logo will be unveiled and Fort Lauderdale Strikers uniforms. I'm getting giddy, but I like it. Fort Lauderdale Strikers. I Agree 1000% Ft. Lauderdale Strikers.